Mixed Matial Arts fighter Randy Couture, aka "The Natural" was born June 22, 1963. Prior to entering MMA, Couture competed in Greco-Roman wrestling in both the military and at Oklahoma State University, where he would go on to become a three-time All American. Couture made his fighting debut in 1997 at UFC 13, and has won UFC championship titles at both Light-Heavyweight and Heavyweight. Couture came out of retirement on March 3, 2007, at UFC 68, where he defeated Tim "The Maine-iac" Sylvia by unanimous decision, to once again regain the Heavyweight belt. Only a few days after his championship victory at UFC 68, Randy Couture celebrated by paying just under $1 million for a two-story home in the Las Vegas, Nevada community of Foothills at Southern Highlands. The Natural's new home offers over 3,700 square feet, four bedrooms, five bathrooms, two fireplaces, and a swimming pool. 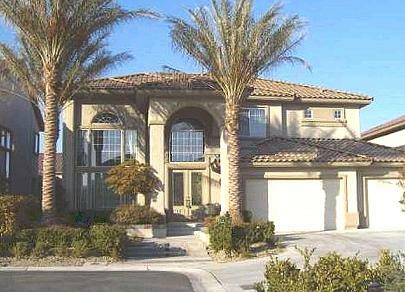 Randy Couture's Las Vegas house.